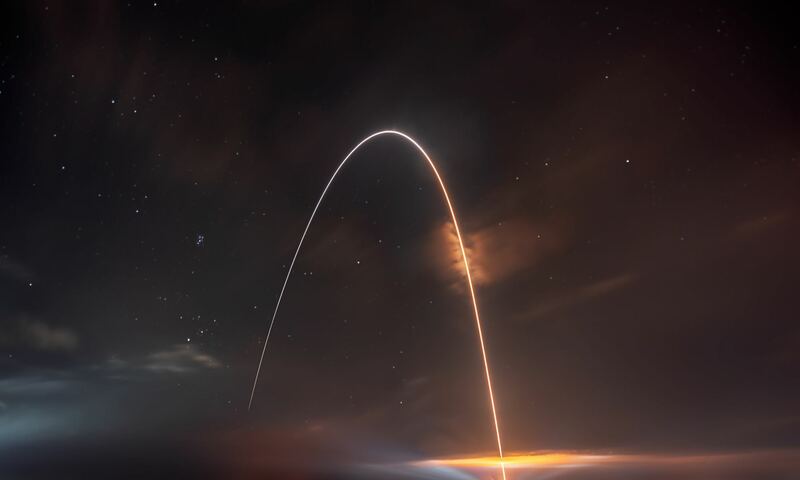 Israel launched an “Ofeq 9” satellite on Tuesday, an advanced remote sensing satellite that likely is capable of high resolution surveillance to monitor Iran’s nuclear program. The satellite was launched on Israel’s Shavit launch vehicle. But in an Israel Defense Ministry document provided to Universe Today, the Ofeq 9 satellite was listed as capable of scanning a swath 7 km wide, with a resolution better than 70 cm and a pointing accuracy to within 20 meters. The satellite will initially be launched to an elliptical transfer orbit – 620 x 307 Km, and following the checkout, the final orbit will be approximately 500 km above Earth. The Shavit launcher is a 3-stage launcher, 20 meters high and weighs approximately 30 tons. With the launch of Ofeq-9, Israel has six spy satellites in space. The satellite was made by Israel Aerospace Industries Ltd. The Shavit launcher has been in use since 1988, when the first Ofeq satellite was put into orbit. Israel, which has the Middle East’s sole undeclared nuclear arsenal, regards Iran as its principal threat after repeated predictions by the Islamic republic’s hardline President Mahmoud Ahmadinejad of the Jewish state’s demise, according to news reports from Jerusalem. Israel suspects Iran of trying to develop atomic weapons under the guise of its nuclear program, a claim Tehran denies. Sources: SpaceTravel.com, and special thanks to Avi Blizovsky, Editor Hayadan Science News in Israel. Wow. Congratulations on a scoop. All they are doing here is provoking their enemies – as if there was not enough tension already. The exact same rules to Iran should also apply to Israel too. All warlike states should be condemned by everyone – especially in the light they already have nuclear warheads. Crazy people with crazy ideas with deadly intent – not a good mixture. I look upon this as well with some dismay, though not quite as far as disgust. Israel has failed to exist as a functional state with any real relationships with other nations in its region. There are a number of reasons for this, and the Arabs are complicit in this problem. A part of the problem is that Israel has functioned in some ways as the US surrogate military force. United States foreign policy often involves a fair degree of duplicity as well, where we arm nations such as Saudi Arabia. The only US President who made any serious effort for some Middle East peace was Jimmy Carter, and for the rest is has generally been about bolstering military power of Israel, but curiously of other Arab states as well. There’s money to be made in making arms. You can be virtually certain that this Shavit launch was done with the approval of the State Department, which is the case for most Israeli military actions. This will have no positive impact on the ulcer of Gaza and the rest of the Palestinian region (West Bank), where this is really the crucial issue Israel faces. I suspect this launch is meant to lay potential ground work for an attack against Iran — done by either the Israelis or the US. If an attack against Iran is metted out I am certain this will unleash an avalanche of troubles we may almost never get out of. At 20 metres accuracy it sounds more like a targetting aid. That’ll be for the nukes they don’t have. I echo the sentiments expressed by the previous two contributors. Any sympathy for Israel evaporated long ago. Sigh, news about Israel, and we have to talk politics, even here on an astronomy website. Some … er … people cannot restrain from saying something anti-israelic on each and every bloody occasion they get. Sorry to Nancy Atkinson, but this is inevitable. I’m glad, that Israel, the only Democracy in the Middle East, is able to launch satellites. Israel is surrounded by dictatorships, partly islamistic, partly fascistic, and partly both, and by “areas” ruled by criminal organisations, which again and again attack this country. Having good relationships with nations, failed nations, criminals, and fanatics like these is impossible. My country is a close ally and friend of Israel. This includes military cooperation. I would be glad, if we have been able to help Israel in developing this technology. Sorry again to Nancy Atkinson. As far as I’m concerned: No further comment. Please note that my comments here are not anti-Isreal here nor I am favouring the Arab league of nations. With Israel’s words in this article again says nothing to do with peace!! Surely the United States has satellites already doing the dirty work, and should readily share its information with Israel – who would at least act properly with the threats to Israel! As for actually saying; “Some … er … people cannot restrain from saying something anti-israelic on each and every bloody occasion they get.” is quite offensive for those who are mostly bipartisan. No one here is saying anything here but hoping for peace in this region of the world. It is just turning the flame up just to antagonise other countries that is deplorable. All I’m saying is that this nonsense has to be stopped, or the rest of us just pay with their inherent stupidity of making our world unsafe and the atmosphere strewn with radioactive dust! I would also like to say, to Mr. Ivy even though he has promised no further comment, that Democracy with a capital D is not a seal of good behavior for any country. It should be obvious, but many folks like to throw around Democracy like it’s the ultimate good in the universe, and that a Democratic government is the most righteous and perfect entity that humans can create (but of course, we all know that the most perfect entity is a corporation *eyeroll*). A country (that is, a government) should only be judged by how morally it conducts itself. I would also like to say that there is a good chance that I’ve been trolled. Let’s just call it a convenient prompt for a flurry of reasonable assertions. I am not making an anti-Israeli pitch. Half my religious background is Judaism, so I am certainly not making an anti-Zionist rant. The current situation is just not stable. A nation in a constant state of militarism against enemies will eventually fall. To compound matters Israel is reliant upon the United States. Without US power Israel would dry up and blow away. You can be sure that considerable US investment went into this Shavit rocket and the Ofek satellite — at the expense of the US. If you are tracking world events much, and the relative status of nations, you should at least suspect the US is in serious trouble. Our position in the world is rapidly diminishing. From an Israeli perspective this should be very troublesome, for in 25 years the US might go the way of other delined or collapsed empires. The US may no longer be in a position to prop Israel up, no matter how much political support there might be for Israel. So it might behoove Israel to start taking a different course in the future. It would be risky, but frankly in the long run I don’t see it any more risky that the status quo. While not wanting to comment on the political aspects of this story, I wonder if these spy satellites might be used to look for possible Syrian-supplied Scud missiles smuggled into Lebanon, as reports from Israel (AFAIK unsubstantiated) this past April have claimed? Or maybe to monitor transportation of Scuds in the region? Would they be of any military use outside of monitoring Iraq? Syria might be involved but it would be minor against the terror of a nuclear threat! Did they have speech writers back then? These guys knew how to speak. cipater, were you pointing to Turkey as an example of democracy? They’re still trying to find their democratic footing. It’s far less likely these days that the military will remove the current government via a coup as it has happened since the 60s. I agree with you on the moral standard by which to judge governments but democracy is probably the least imperfect way of *trying* to achieve that. The existence of a democratic process is a a fundamental benchmark by which to judge a nation but not the sole one. Israel is not a warlike country. otherwise it woud use long time ago its power to concure the world. israel have its power only for one reason – to defend its citizen. one of the ways to prevent a war is to show the enemies that they will hatm if they will start a war. I am not part of the right wing ideas of Mr Netanyahoo but he is not crazy. our enemy is crazy. anyway you would like to have primitive countries where sciene does not exist and women are restricted then a modern and Academic florish state. as for Mr. Crowell. What does it mense “Israel has failed to exist as a functional state with any real relationships with other nations in its region.” i hote that is not meaning that we dont have right to exist? you mentioned Gaza and the west bank. you can not compare them. Gaza peope decieded that throing rockets on israeli kids is a brave move and they cry when they are paying for that. the waste bank people decided to advance their economy and to avoid trouble (not all of them, there are Hammas people there too) but their goverenment is practicaly prevent attacts and they are much more advanced economically then the Gazans. to amdylinv “Any sympathy for Israel evaporated long ago.” where exacly we shoudl go according to your sympathy? jon – as far as i read israe is the one that reported to the US that syria is delivering scud missles to Hizbulla in Lebanon. it is an existing threat to israel becuse not the Hizbullah that dont have any responsibility for citizens can now target all of israel. Did you Know that Israel is ranking now. 1 in the middle east in scientific papers per year. much more than the Arab world at total the only country in the area that move to close some of the gap is Iran. Israel is a legitimate state. it survived numerous wars it will also survive this legitimacy war. the people dont have anywhere else to go. This launch serves two purposes. 1) Its a spy satellite. 2) It demonstrates that Israel has the capacity to launch ICBM’s on short notice. Now, THAT’S a delicate way of putting Iran’s stated policy of wiping Israel off the map! As Jon Hanford points out, “these spy satellites might be used to look for possible Syrian-supplied Scud missiles smuggled into Lebanon” and I will add to look for missiles and rockets smuggled into Gaza. Odd that the comments about an article concerning an Israeli satellite are all about Israel having no right to exist and other weird political digressions. And no one is commenting on the space science aspects … here on an astronomy site. “This will have no positive impact on the ulcer of Gaza.” That’s pretty far off-topic, n’est-ce pas? As to the comment by Hon. Salacious B. Crumb: “Syria might be involved but it would be minor against the terror of a nuclear threat!”. Syria is ANOTHER major threat. That’s why Israel recently destroyed the North Korean nuclear weapons facility in Syria. As to his “All they are doing here is provoking their enemies”, I must ask – what is the provocation? What is being provoked? Who is being provoked? Provoked to do what? Do French spy satellites provoke anyone? Do Russian satellites provoke anyone? Chinese satellites? Japanese satellites? As to his “All warlike states should be condemned by everyone” I should point out that we are currently involved in waging war in three countries, have hundreds of thousands of soldiers stationed in hundreds of bases and dozens of war ships throughout the world, and recently invaded several countries including Granada and the Balkans. Wow. Talking about peace and your spectacularly condemned for it! I say “All warlike states should be condemned by everyone”. The comes the reply by the clearly bigoted Pennywhistler ; “…we are currently involved in waging war in three countries.” Ergo, Israel must be a warlike state!!! Really. Most of the world is already sick to death of your stinking attitude. IMO, Israel, Iran, Syria and their usual warmongering cohorts, should all start acting like they are part of the rest of the world and stop acting like proud and pompous little children. So Hon. Salacious B. Crumb you want to kill me. you compare a victim to those who want to kill him with your ignorance, and says that it is not good for the media that people defend themsleves. i dont know if you know but most of the wars that israel was involved in started by enemy thay thoght to find weakness. if we will show them that we are strong they will think twice. as peace lover you must endores this behave and not to condemned us. your house is not under therat of missles from canada and mexico. mine is under threat from crazy extrimers from both side from the south and from the north. without strong hand in both two last decaeds war that have been forced on us it would be long time ago bombed. Oh please, why be so over dramatic?? Of course I don’t want to kill you or anyone is Israel nor do I wish that to anyone in Iran, Syria or anyone else. I talk about peace in the world, now you instead go for the usual victim card. Sure, all countries have the right to defend themselves, but they do not the right to perpetuate wars and threaten others. Again I will condemning anyone who wishes to encourage, provoke or continue stupid wars. You should be working harder for peace, if not for your children’s sake, for the rest of the world’s sake. in my view if Israel, Syria and Iran were taken completely out of the picture, our world would be a much happier place. All I am saying is that by launching spy satellites just makes places like Iran more nervous and makes them want to work harder to attack Israel. I.e. Develop nuclear weapons or launch their own spy satellites. Next it is something else to raise the stakes, and so the frightening escalation cycle continues. My country does support Israel (much to our detriment IMO), and all I hear recently is people being killed on ships International waters or using fake passports in one of Israel’s operations. It seems every time there is a crisis, America, Europe and even Australia is propping you up and supporting you. These days, most are starting to feel Israel is acting rather ungrateful and is oblivious to any criticism. I think that Universe Tpday is not a place to teach you facts about the real world that you faild to understand due to the low level of news coverage in America. if you want give me your email and i will explane you exactly who against whom. ofcource Universe Today is one of the best site that i know. that subject is not one of its topic, and you are lucking basic knowledge of facts. let’s coninue the thread by mail. I think it is about time you had a definition of democracy. So here is my 2 cents worth. A democratic society give each member of that society the freedom to make responsible choices within that society. That very simply defines the two terms FREEDOM & DEMOCRACY. Only the individual can and must be taught from day one, that they alone are responsible for their own thoughts, feelings & actions. No other person can know our thoughts, & feeling from moment to moment. Making choices implies responsiblility for those choices..
Having the courage to take that responsibility is being mature. Not taking responsibility for yourself is imature. Just to put it in the correct vane . If & when we become a mature society. Maybe we will be allowed to join the Federation of Planets. After all, considering the Copernican Principle. They must be out there. I have no interest to debate anything with you – especially in regards war-orientated countries like Israel. I know the reality, and the arrogant and condescending presumption “to teach you facts about the real world” just so you can spread your propaganda is not on. My argument for peace stands as is. Thanks for you contribution here.